On this, the first full day after Martine’s departure, I have been reading, watching old movies, and waiting for a major rain event that is due this week. I probably will not go downtown this Thursday because that’s supposed to be the heaviest rain day. Soon, I will have to get up and wash the dishes. That is one of the things that Martine used to do. That and the laundry are going to be my new duties. 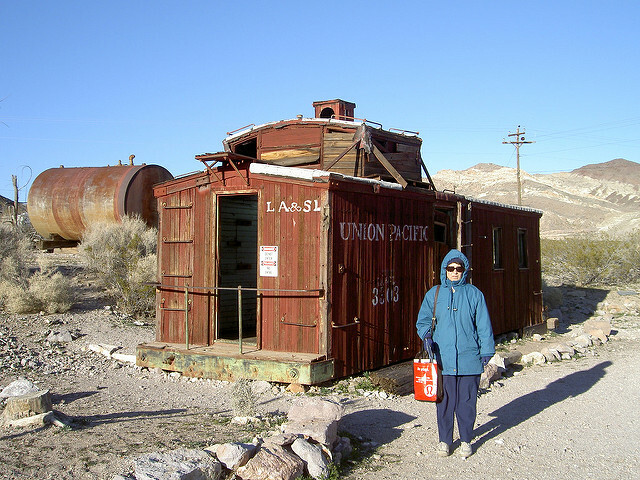 I look at some of the old photos I had on Flickr and found the above pic of Martine standing by a ruined caboose by the ghost town of Rhyolite, NV—an old mining town that sprang up out of nowhere, became a fairly major railroad destination, and suddenly melted away into the sands of the desert early in the 20th century. While I know I’m going to miss Martine, I do not plan to let my whole life swirl down the drain. I have to be more active about contacting my old friends and making new ones. Wish me luck. Good luck, Jim! I have no worries about you, you’ll cope.